COLUMBIA, SC – Clemson star defensive end Gaines Adams, the No. 4 overall selection by Tampa Bay in the recent NFL draft, has been named the 2007 Amateur Athlete of the Year by the South Carolina Athletic Hall of Fame. Adams was only the second unanimous All-American in Clemson history and was voted a first team All-American by all five major news services. 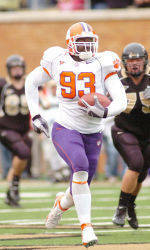 He was the ACC defensive player of the year for 2006. He had 12.5 sacks, tops in the ACC, third in the nation and tied for the second most in a single season in school history and set the Clemson record for sacks by a senior. Adams tied the Tigers’ career sack record with 28. He also had a school record streak of eight consecutive games with a sack. He had 63 tackles for the season, his career high and he is second in Clemson history among defensive linemen in pass breakups with 21. He finished his college career with two sacks against Kentucky in the Music City Bowl. He started in each of the last 25 games of his career. Adams will be honored at the annual SCAHOF induction banquet on May 21 at the Columbia Metropolitan Convention Center. The induction Class of 2007 includes four former pro athletes — Major League Baseball players Bill Spiers and Jerry Martin, Gary Gregor of the NBA and Max Runager of the NFL – as well as thoroughbred pioneer Cot Campbell, road runner/coach Catherine Lempesis, former Clemson soccer coach I.M. Ibrahim, and former Citadel star Jack Douglas. Tickets, at $500 for a table of eight, can be purchased by contacting the hall of fame at 803-779-0905 or by logging on to www.southcarolinaathletichalloffame.org. Some 30 past SCAHOF inductees will return for the blue jacket ceremony. Bill Spiers The Cameron native, from a multi-sport star athlete at Wade Hampton Academy where he quarterbacked his team to a two SCISA state football championships, accepted a baseball scholarship to Clemson, where his father Bud and brother Mike played. Bill wound up making first-team All American by The Sporting News as well as first-team All-ACC and All-ACC Academic. He holds the Clemson single-season record for triples with 11. After hitting .345 his first two seasons, he answered football coach Danny Ford’s ad in the student newspaper for a punter and averaged 39.2 yards, 12th-best in school history. The Milwaukee Brewers made the slick-fielding infielder their first-round draft pick and Spiers went on to a 13-year Major League Baseball career with a .271 batting average, 37 home runs and 388 RBI. In his latter years, he joined the Houston Astros, and enjoyed his best season with a .320 average, 27 doubles and 48 RBI while playing seven different positions. The Charleston Post-Courier named Spiers No. 57 on its list of South Carolina’s 100 Greatest Athletes of the Century. When he retired in 2001, Spiers declined an offer to become a coach with the Astros and lives in his hometown with wife Laura and coaches his two children in youth sports. Jack Douglas Quarterback, one of the Citadel’s most successful teams ever and still holds many of the school’s offensive records. He finished as the all time leading rushing quarterback in NCAA division 1AA football with 3674 career yards. He led the bulldogs to a tie for the #1 ranking in the final 1AA poll in 1992, the year the bulldogs captured their second ever Southern Conference Championship. That same year he was selected SC male amateur athlete of the year and the SC offensive player of the year. During his career, Douglas led The Citadel to memorable upsets over bigger colleges such as Navy in 1989, SC in 1990, Arkansas in 1992 and Army in 1991 and 1992. He served as team captain his final two years at the Charleston school. Citadel retired his jersey in 1993 and inducted him into its HOF in 2000. Currently director of core market development at Colonial supplemental insurance.